HEALTHIEST UNDERWEAR IN THE WORLD! Limited Time: Try Stud Briefs for 90 days and experience why no underwear is as comfortable as healthy feels! ​If you're not 100% satisfied, we'll give you your money back! Your normal boxer and briefs trap more than 1.4°C (2.5°F) of heat! This is enough to reduce sperm and testosterone production by over 40%! Read More. 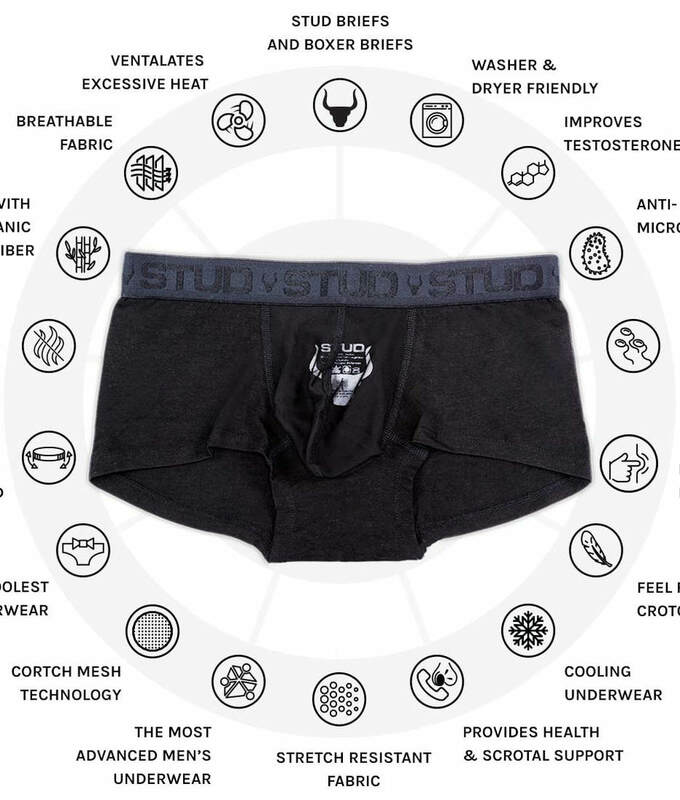 Stud Briefs technology uses a cooling mesh, and healthy scrotal support to enhance testicular cooling! In Focus: Here with thermal imaging, we found that Stud Briefs is on average 1.9 degree cooler standard "cooling" underwear. Boxers or Briefs? Neither. Stud is the Best! Stud Briefs was designed by two Canadian male fertility experts, Dr. Spence Pentland and infertility author Daniel Johnson. We designed it to be the healthiest underwear in the World! Stud Briefs utilizes a crotch mesh technology that helps maximize testicular cooling. ​Get Focused: Did you know that sperm count decreases by 40% for every 1 °C (1.8 °F) increase of median daytime scrotal temperature? Overheating is also linked to testicular shrinkage and impaired testosterone production. ​Now consider that both normal boxers and briefs increase median daytime scrotal temperature by about 1.4 °C (2.5 °F)! It is no wonder that the sperm counts of Western men have been plummeting year after, and have declined by more than 60% since 1973! Try Stud Briefs and experience why no underwear is as comfortable as healthy feels.